Post-screening conversation with co-director Zackary Canepari, producer Sue Jaye Johnson and professional boxer Heather Hardy. T-Rex is an intimate coming-of-­age story about a new kind of American heroine. For the first time ever, women’s boxing was included in the 2012 Olympics. Fighting for gold from the U.S. was Claressa “T­-Rex” Shields, just 17 years old, and by far the youngest competitor. From Flint, Michigan, Claressa is undefeated and utterly confident. Her fierceness extends beyond the ring. She protects her family at any cost, even when their instability and addictions threaten to derail her dream. Claressa does have one stable force in her life. Coach Jason Crutchfield has trained her since she was just a scrawny 11-­year-­old hanging out at his gym. Jason always wanted a champion, he just never thought it’d be a girl. Her relationships with her coach and her family grow tense as she gets closer to her dream. But Claressa is fierce and determined. She desperately wants to take her family to a better, safer place and winning a gold medal could be her only chance. ZACKARY CANEPARI (USA, 1979) is a visual storyteller working in a variety of different mediums. He began his career as a photojournalist in India/Pakistan before teaming with filmmaker Drea Cooper in 2010 and launching California is a place, a documentary film series which screened at Sundance and was viewed more than two million times. The California series created new opportunities in both the commercial space and the editorial space for Canepari’s work and led to the project that first sent him to Flint, Michigan. 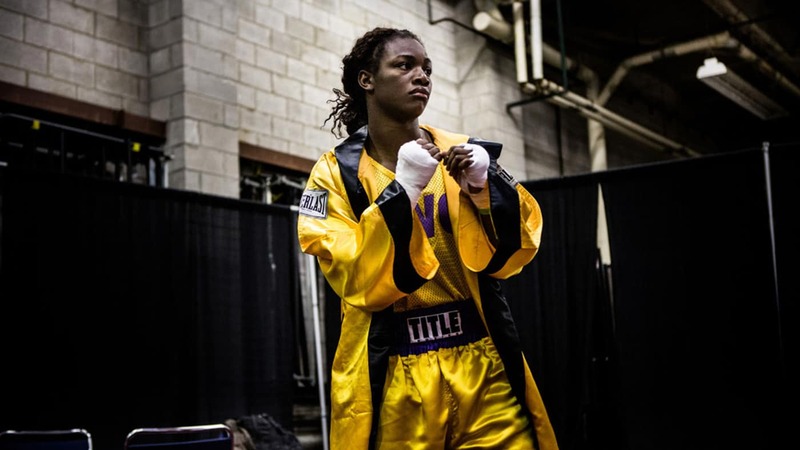 The documentary feature film T-Rex, also co-directed by Drea Cooper, told the story of teenage Olympic boxer and Flint native, Claressa "T-Rex" Shields. T-Rex premiered at SXSW in March 2015 and was featured on PBS in August 2016. Canepari then released his first monograph about Flint, titled REX, which was published by Contrasto and won Photobook of the Year at the POYi Awards. In 2016, he launched Flint is a place, a sort of version 2.0 to the California project. Flint is a place consists of reportage, short films, found photos, virtual reality, interactive maps, and archival material. Canepari’s ongoing work in Flint resulted in his first World Press Photo Award and being named as Multimedia Photographer of the Year at the POYi Awards in 2016. SUE JAYE JOHNSON spearheaded an unprecedented collaboration between The New York Times Magazine, NPR and WNYC to tell the story of the first women to box in the Olympics in 2012. As a part of the series, Johnson and collaborator Joe Richman of Radio Diaries gave Claressa Shields a microphone and recorder to document her journey to the Olympic Trials. ‘Teen Contender’ aired on NPR’s All Things Considered and won a Peabody Award. Over the last decade, Johnson has lived and worked in South Africa where she co-­founded Iliso Labantu, a collective of township-­based photographers. Her work is supported by Creative Capital, the NEA and OSF. She lives in NYC with her husband and two daughters. HEATHER HARDY is a professional boxer from Brooklyn, NY and has been "fighting" to get women's boxing the visibility it deserves on national TV. Hardy currently holds two division WBC Champion Belts, Super Bantamweight and Featherweight. She trains at the World Famous Gleason’s Gym located in Brooklyn, NY which has been home to many boxing champions over the years. She trains at the World Famous Gleason’s Gym located in Brooklyn, NY which has been home to many boxing champions over the years. Outside of training, she's a single mother and a personal boxing trainer working out of Shadowbox with celebrities and business professionals. Suggested donation: $5 Bronx Residents, $10 General Admission, 18 and under Free. Tickets are available at the door. Our venue is on the ground floor and is wheelchair accessible. The bathroom is non gender-segregated. For further information call 718-993-3512.